One of the best things about fall is the farmers market fun you can have! Over the weekend friends and I went to Stuckey Farm Market (Sheridan) northwest of Indianapolis to pick apples. It was my first time pickin’ and it was fun! We trekked down the many aisles in search of the perfect apples. They had Empire, Ida Red, Jonagold (my favorite), Mutsu, Fuji, Jonamac, Golden Delicious and these are only the beginning. When we got to pickin’ we almost couldn’t stop. Now, I have enough apples to make several pies, dumplings or both. 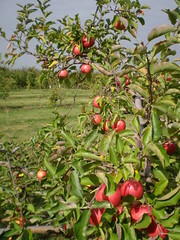 For other places to pick apples and more check out the Indiana Farmers’ Market, U-Pick and Agritourism Directory.